My wonderful friend and co-worker T-West planned a little happy hour at The Edison tonight in honor of my imminent departure. What an incredible place! Not only was I surrounded by the love and good cheer of my friends, but the ambience of The Edison was just something you don't encounter every day. The Edison is an enormous bar and lounge located near Little Tokyo in a somewhat hard-to-find nondescript building, the entrance of which can be found in a one-way alley. But, boy, is it a treat when you finally find the place! The building is the home of the first private power plant in downtown Los Angeles and has kept much of the original architecture and old machinery. When you enter, you're whisked to another era. Servers flounce about in flapper dresses or scurry in newsboy caps and suspenders. Black-and-white silent films flicker on flatscreens, which hang on the exposed brick walls. After you make your way down the steep staircase (and grab onto the handrail for dear life in the darkness), you're surrounded by all sorts of artifacts from days of yore. I thought the look was rather unique, and the place, while huge and high-ceilinged, had this great vibe and intimacy in various nooks and crannies all around. I'm so sad to have discovered this place so late! Libations were plenty, original, and strong. I started with the Edison (lavender-honey infused liquor, pear liqueur, and fresh-squeezed pear nectar). If you like pears, this is the drinky-drink for you! I found the Edison to be chock-full of boozey-booze, but, as a lightweight, I wanted a second opinion, so I had Ironman take a sip. He confirmed, "Yup, you're gonna get blitzed!" Whee! I followed the Edison with a Peach Whisper (peach brandy and blood orange with a splash of apricot nectar). Oh, nummy-nummers! Yes, I am recapping while buzzed. Maybe I should take a break and come back later. Ok, I'm back! With pics of food! We shared some "Tesla fries" (Get it ? Get it? Oh, you clever Edisonians! ), which were yummilicious sweet potato fries accompanied by ketchup and chipotle remoulade; crisp flatbread with tzatziki, olive tapenade, and hummus; and an appetizer platter, which included shrimp cocktail, oysters rockefeller, smoked salmon, deviled eggs, grilled asparagus, tiki wings, and -- my favorite treat of the night -- lobster corndogs! 'Twas a crunchy savory lollipop! The boys weren't too interested in getting any mugshots, so the girls struck a pose together. Special thanks to my pal T-West who organized the shindig! I love you! I swear you go to the coolest places!! Glad you had a great time. Yum! Those lobster corndogs sound so good. I've never heard of this place but it looks like something I'll have to check out. Oooh, that place looks fun! Can we have a blog party there? Also, I like the drunk posting. You do a lot of this-y this. 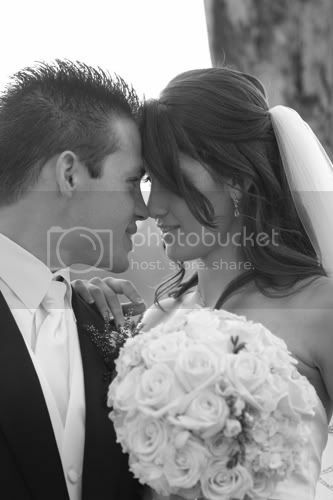 I stumbled upon your knot page while looking for ideas for my wedding and have since become obsessed with reading your blog during my work day so that I may live vicariously through your eating experiences. Thanks for entertaining me every day!! this place sounds amazing. I will have to go there...and soon!!! That martini's look and sound divine. YUM! When is the next get-together!? drunkenmonkey's smile is so big! just added edison to our "fun" excel file. an oxymoron, i know. Ooooh! That place looks and sound awesome. I'm definitely going to go there someday. Hopefully soon. :) So sweet of your CW to put that together for you. first... yes, OG Clif did know who "Tesla" was. Funny how those things went right on past me in college. second... I'm happy you were able to get 'blitzed' with great peeps. what a cool looking place! that was really nice of your CWs to take you out. and mmmm, lobster corndogs. i MUST try this. 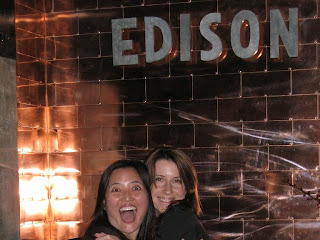 I LOVE the Edison!! Such a cool space! How sweet of your coworkers to throw you a party! Can't. Stop. Playing. With. Hair.